At Prescribe Nutrition we know the importance of having a healthy snack on hand. Having something to eat that includes the all too important trifecta: fat, fiber & protein can ward off making bad choices when you’re feeling that blood sugar crash and ready to grab for anything. 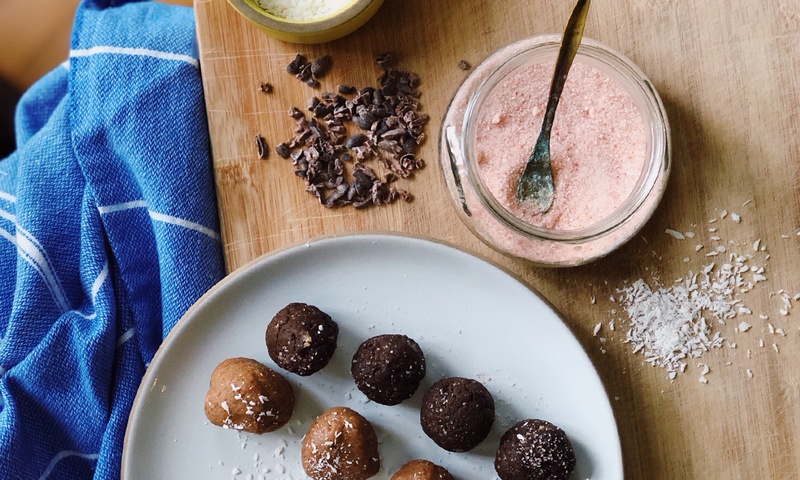 Energy bites, snack balls, whatever you like to call them, are easy to make and store beautifully in the fridge or freezer, making them ideal for that easy grab and go nourishment we all need in our busy lives. Also, they tend to be deliciously sweet…sometimes even decadent, so they can solve that sweet tooth issue some of us battle with…(ahem, me). Add all ingredients to a food processor and blend for about 2-3 minutes, scraping down the sides as you go. You should get a thick paste/ball. If you need to thicken, add more coconut or almond flour; if you need to thin, add a bit more tahini or coconut oil. Place the paste in the freezer for about 15 minutes to firm up, this will help with making the balls. Scoop out balls approximately 2 teaspoons in size and arrange on a baking sheet lined in parchment. Put in the refrigerator or the freezer. They should be good to enjoy in about 30 minutes! Keep covered in the fridge for one week or the freezer for a month. Place the hazelnuts into a food processor and pulse until they are a fine consistency. While the food processor is running, add in the dates one at a time. Add in all other ingredients and blend until everything is well combined. The mixture should be slightly sticky but holding together. Place the mixture in a bowl and refrigerate for ~ 20 minutes. and/ or coconut shavings on a plate. Wet your hands slightly with water and form the truffles between your hands. They should be slightly smaller than a ping pong ball. Best enjoyed cold, store in the fridge or freezer.